The SR42BMDEXPNDNR3 is part of our new line of mid-depth rack enclosures. Our new line offers 36" (927mm) depth opposed to the standard 42" (1050mm). The SR42BMDEXPNDNR3 houses 3000 lb of standard 19-inch rack equipment in 42U. It is an expansion model that comes without sides, doors or roof. The front and rear pairs of vertical rails have square mounting holes that are adjustable in quarter-inch increments from 4 to 31 inches. Adjustment is quick and an easy-view depth index ensures consistent rail placement without requiring time-consuming measurements. Each rack space within the enclosure is numbered for ready reference and supports tool-less button-mount 0U installation of up to four compatible PDUs and cable managers. All components of the SR42BMDEXPNDNR3 are grounded to the enclosure frame. Front and rear threaded grounding points are provided for connection to the facility earth ground. To simplify deployment, the SR42BMDEXPNDNR3 comes with preinstalled 3" casters that enable it to be easily maneuvered into the desired location, where it can be secured by adjusting the preinstalled levelers. Note: the casters are intended for minor position adjustments and are not designed for moving the enclosure over long distances. The SR42BMDEXPNDNR3 comes with a 5-year product warranty. As part of the SmartRack family, the SR42BMDEXPNDNR3 is compatible with Tripp Lite’s extensive range of rackmount accessories, enabling you to customize your solution to meet any requirement. Tool-less accessory mounting rails (2 rails per enclosure) include slots for quick installation of compatible PDUs and vertical cable managers. Mounting slots are arranged in an industry-standard pattern compatible with a wide variety of accessories. Each rail can accommodate two vertical PDUs or cable managers side-by-side (four items per enclosure). Maximum usable internal depth of 31 inches/787 mm (front to rear rail). Weight ratings of 3000 lb stationary and 3000 lb rolling. Built in baying tabs allow premium open frame racks to be combined securely in rows. Center-to-center width can be set at 600mm or 24" to match standard data center floor tiles. Leveling feet extend to allow premium open frame racks to be positioned on uneven floors. Levelers are removable. 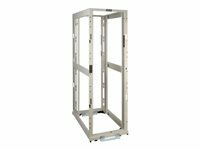 Compact design allows the premium open frame racks to roll through standard height commercial doorways. Convenient grounding system. All components are grounded to the premium open frame rack structure which includes multiple connections for facility ground. Open top and bottom for cable access. Included stabilizing brackets are used for shipment and can be reattached at the bottom of the premium open frame rack on the inside or outside of the rack. Compatibility with all cable management accessories. 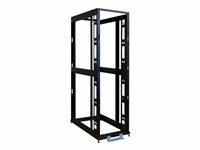 The SmartRack 42U Standard-Depth 4-Post Premium Open Frame Rack has NO doors and NO side panels. The 'EXP' version is an expansion model used when several cabinets are bayed together. Its integrated baying tabs make it easy to combine multiple enclosures in rows for data center applications. This enclosure is also compatible with hot-aisle/cold-aisle configurations. The SR42UBEXPND houses 3000 lb of standard 19-inch rack equipment in 42U. Its front and rear pairs of vertical rails have square mounting holes that are adjustable in quarter-inch increments from 4 to 37 inches. Adjustment is quick and an easy-view depth index ensures consistent rail placement without requiring time-consuming measurements. Each rack space within the enclosure is numbered for ready reference. Two of the adjustable vertical mounting rails support toolless button-mount 0U installation of up to four compatible PDUs and cable managers. This feature makes it easier to route cabling to rack equipment and reduces cord clutter. All components of the SR42UBEXPND are grounded to the enclosure frame. Front and rear threaded grounding points are provided for connection to the facility earth ground. To simplify deployment, the SR42UBEXPND comes with preinstalled casters that enable it to be easily maneuvered into the desired location, where it can be secured by adjusting the preinstalled levelers. Note: the casters are intended for minor position adjustments and are not designed for moving the enclosure over long distances. The SR42UBEXPND comes with a 5-year product warranty. As part of the SmartRack family, the SR42UBEXPND is compatible with Tripp Lite’s extensive range of rackmount accessories, enabling you to customize your solution to meet any requirement. 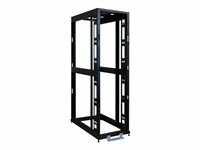 The SmartRack 42U Standard-Depth 4-Post Premium Open Frame Rack houses 3000 lb of standard 19-inch rack equipment in 42U. It is an expansion model that comes without sides, doors or roof. The front and rear pairs of vertical rails have square mounting holes that are adjustable in quarter-inch increments from 4 to 37 inches. Adjustment is quick and an easy-view depth index ensures consistent rail placement without requiring time-consuming measurements. Each rack space within the enclosure is numbered for ready reference and supports tool-less button-mount 0U installation of up to four compatible PDUs and cable managers. All components of the SR42UBEXPNDNR3 are grounded to the enclosure frame. Front and rear threaded grounding points are provided for connection to the facility earth ground. To simplify deployment, the SR42UBEXPNDNR3 comes with preinstalled 3" casters that enable it to be easily maneuvered into the desired location, where it can be secured by adjusting the preinstalled levelers. Note: the casters are intended for minor position adjustments and are not designed for moving the enclosure over long distances. The SR42UBEXPNDNR3 comes with a 5-year product warranty. As part of the SmartRack family, the SR42UBEXPNDNR3 is compatible with Tripp Lite’s extensive range of rackmount accessories, enabling you to customize your solution to meet any requirement. Heavy duty leveling feet extend to allow premium open frame racks to be positioned on uneven floors. Levelers are removable. The SR42UBMDEXPND is part of our new line of mid-depth rack enclosures. Our new line offers 36" (927mm) depth opposed to the standard 42" (1050mm). The SR42UBMDEXPND is a 42U SmartRack enclosure with NO doors and NO side panels. The 'EXP' version is an expansion model used when several cabinets are bayed together. Its integrated baying tabs make it easy to combine multiple enclosures in rows for data center applications. This enclosure is also compatible with hot-aisle/cold-aisle configurations. The SR42UBMDEXPND houses 3000 lb of standard 19-inch rack equipment in 42U. Its front and rear pairs of vertical rails have square mounting holes that are adjustable in quarter-inch increments from 4 to 31 inches. Adjustment is quick and an easy-view depth index ensures consistent rail placement without requiring time-consuming measurements. Each rack space within the enclosure is numbered for ready reference. All components of the SR42UBMDEXPND are grounded to the enclosure frame. Front and rear threaded grounding points are provided for connection to the facility earth ground. To simplify deployment, the SR42UBMDEXPND comes with preinstalled casters that enable it to be easily maneuvered into the desired location, where it can be secured by adjusting the preinstalled levelers. Note: the casters are intended for minor position adjustments and are not designed for moving the enclosure over long distances. The SR42UBMDEXPND comes with a 5-year product warranty. As part of the SmartRack family, the SR42UBMDEXPND is compatible with Tripp Lite’s extensive range of rackmount accessories, enabling you to customize your solution to meet any requirement. Key Features Ships fully assembled for rapid deployment and roll into place on pre-installed casters, allowing the enclosures to be pre-configured and rolled to the final installation location. Casters are removable. The SmartRack 42U Standard-Depth 4-Post Premium Open Frame Rack houses 3000 lb of standard 19-inch rack equipment in 42U. It is an expansion model that comes without sides, doors or roof. The front and rear pairs of vertical rails have square mounting holes that are adjustable in quarter-inch increments from 4 to 37 inches. Adjustment is quick and an easy-view depth index ensures consistent rail placement without requiring time-consuming measurements. Each rack space within the enclosure is numbered for ready reference and supports tool-less button-mount 0U installation of up to four compatible PDUs and cable managers. All components of the SR42UWEXPNDNR3 are grounded to the enclosure frame. Front and rear threaded grounding points are provided for connection to the facility earth ground. To simplify deployment, the SR42UWEXPNDNR3 comes with preinstalled casters that enable it to be easily maneuvered into the desired location, where it can be secured by adjusting the preinstalled levelers. Note: the casters are intended for minor position adjustments and are not designed for moving the enclosure over long distances. The SR42UWEXPNDNR3 comes with a 5-year product warranty. As part of the SmartRack family, the SR42UWEXPNDNR3 is compatible with Tripp Lite’s extensive range of rackmount accessories, enabling you to customize your solution to meet any requirement.